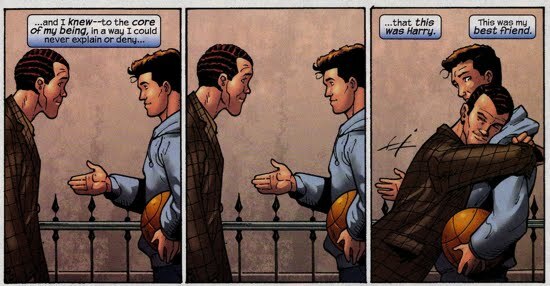 Peter accompanies Harry to New Jersey because Harry has some “business with Liz” in Amazing Spider-Man #581. According to Harry, there’s an issue with his life insurance policy and he is going there to help her out. During the car ride to Liz and Normie's home, Harry decides to tell Peter the whole story surrounding his “death”. In short, he says he took the Goblin serum, it was in his system, it brought him back. 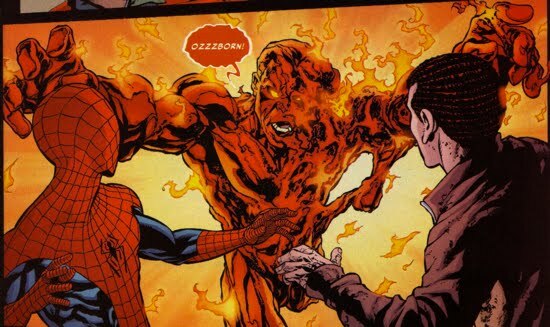 Peter response is that he had thought the Goblin serum killed him, telling Harry that Spider-Man told him that those were his dying words. 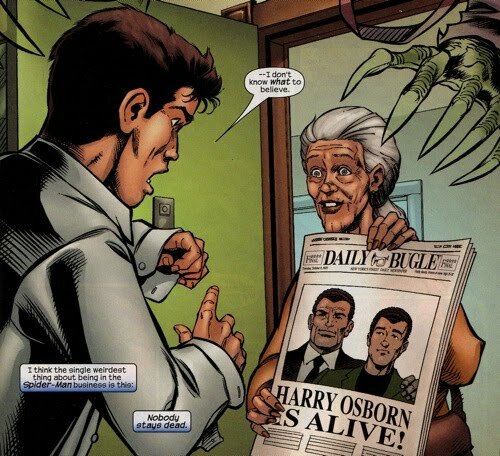 Harry says that he said that because he was “high” on Goblin serum. Harry goes on to say that he didn’t pull this off by himself, there was someone else who took care of it. 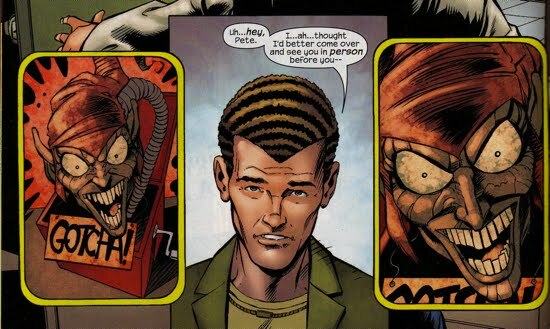 A flashback scene reveals Norman Osborn bribing two medics at a morgue. 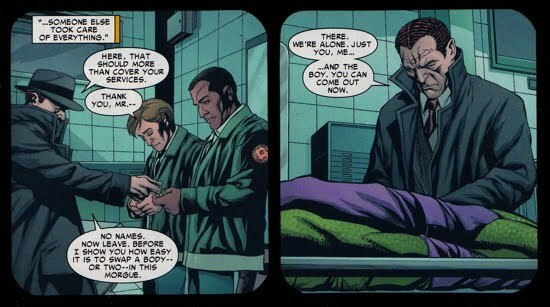 Norman also had the help of Mysterio who was charged with the task of switching the autopsy reports and getting a genetic duplicate for the coffin. 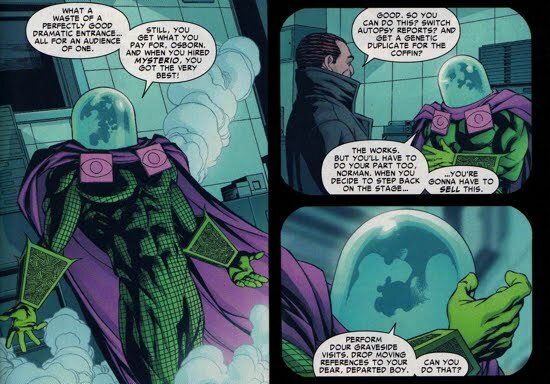 Mysterio reminds Norman that he has to be the one to “sell this”, with graveside visits and references to his departed boy. Even though Harry doesn’t mention his father’s name explicitly, there's a good chance he's aware of what his father did since they were in contact while he was in Europe. However, it's not clear whether or not Harry knows if Mysterio was involved at all, he does not say his name explicitly either. Harry then states that for the next couple of years Norman placed him in all kinds of clinics, claiming that he needed to detox. They had him convinced that his days as the Goblin were a drug induced hallucination. His memory was jogged when he saw his dad in the Goblin suit (during the New Ways to Die), and that most of his memory came back in pieces. 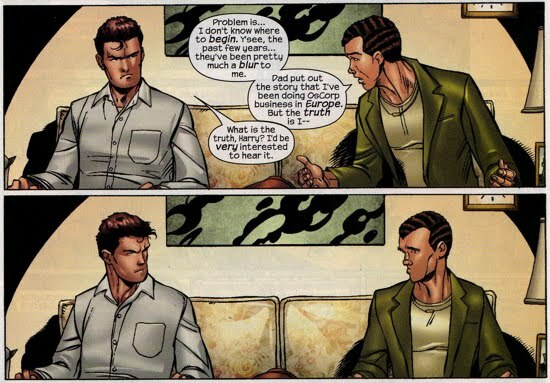 Interestingly, he doesn’t remember everything, including the fact that Peter is Spider-Man. When he did return to the public, he wanted to live a better life and do good for others. 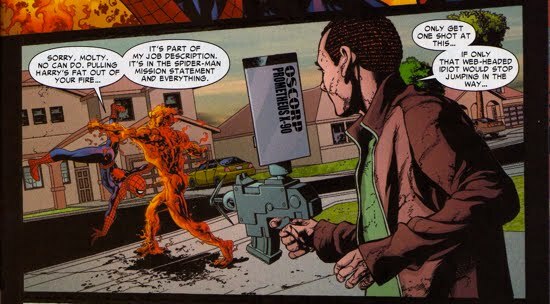 That is why he rebuilt Aunt May’s house, the one destroyed by Charlie Weiderman before they moved into Avengers Tower.